Are you tired of feeling “stuck” financially? Are you ready to start making significant moves in your financial journey and even have your best financial year ever? There is no better time than 2019 to achieve just that. You still have a couple days to add your financial goals to your list of New Year’s Resolutions. You can start by identifying your current status. We know that most people can identify with one of the three categories: struggling, stable, or surplus. Once you know where you fall, you can clearly determine your next steps. Here at I Was Broke. Now I’m Not., we follow a financial ladder in order to have a fully funded life. Check out a copy of the ladder so that you can identify what rung you are currently on and what your next step is. CLICK HERE TO DOWNLOAD YOUR COPY TODAY! If you feel like you are in the struggling category, you should strive to achieve rungs one, two, and three this upcoming year. In doing so you would have set goals, built financial margin with a baseline savings account and start to see your money working for you in your investments. For those who identify with the stable category, you should be position yourself to be able to move to the surplus category. You can do this by completing rungs four and five of the ladder. If you were able to complete those two steps in 2019, you would have eliminated all of your non-house, non-business debt (bye credit cards!) and have built up significant margin with three months worth of expenses in savings. This will allow you to launch into the next category and upwards on the ladder. If you are currently enjoying the blessings of the surplus category, you are almost ready to live a fully funded life and have the ability to positively impact the lives of all those around you. At this point, you can strive to achieve rungs six, seven, and eight of the ladder. You will not only be debt free, but you will also be investing 30% of your gross income into investments. You should also set five key financial goals for the year. If you don’t set any goals, you are far less likely to accomplish anything at all. Consider setting goals in each of the following categories: income, giving, saving, investing and debt elimination. I explain each of these in detail Episode 25 on the Monday Money Tip Podcast. You can check it out HERE. Once you have set your goals, make sure you establish accountability. If you share your goals with someone who has similar goals as you, you will be less likely to falter and give up along the way. Many people have workout buddies when they are trying to get into shape. Consider this a workout buddy for your finances! Lastly, make sure you are taking steps to increase your financial education. This step is not one that ends in 2019 but should be continued year after year. Read some financial books, hire a financial coach. Start learning and don’t ever stop. You won’t regret it. No matter where you are financially, you can make significant strides this upcoming year and position yourself to prosper. Make 2019 the year that you accomplish more than you ever did before on your financial journey. Merry Christmas Eve! Today on the Monday Money Tip Podcast, I’m sharing how you can balance striving for future goals while still being content with what you currently have. We’ll talk about our R&R at the end of the year and goals you should consider for next year. We will also share a very special success story and a big announcement about the future of the Monday Money Tip Podcast! Joe shares each of the categories in which you should set goals for 2019. Hear a very special success story that relates directly to the Monday Money Tip Podcast. Learn how to balance striving for future goals and being happy with what you currently have. Have you ever prepared a budget and faithfully followed it only to have it crushed in the middle of the month because of an expense you forgot about? Does Christmas seem to creep up on you every year? Have you had to suddenly replace the tires on your car? Chances are, you answered yes to at least one of these questions. These budget busters are called “Known, Upcoming Non-Monthly Expenses.” The reason these expenses get forgotten is because they are non-monthly so they tend to be pushed to the back of the mind until the bill suddenly comes in the mail. But when they do finally appear, they can create a financial emergency causing you to either break your budget or go into debt. By knowing what these expenses are and saving for them monthly, you’ll no longer have to “come up” with the money when the bill arrives. You will simply be able to pay the bill in cash. A cool feature of this tool is that not only does it calculate what you would need to save per month, but it also calculates the amount based on different pay frequencies. If you get paid twice per month, you would need to save $289.58 out of each paycheck. For a bi-weekly frequency, you would save $267.31. Regardless of how often you get paid, you can save accordingly and have the money available when you need it. Be sure to recalculate your monthly savings number at least once per year. Don’t forget more long-term expenses such as college, weddings, vehicle replacement, and major home renovations. 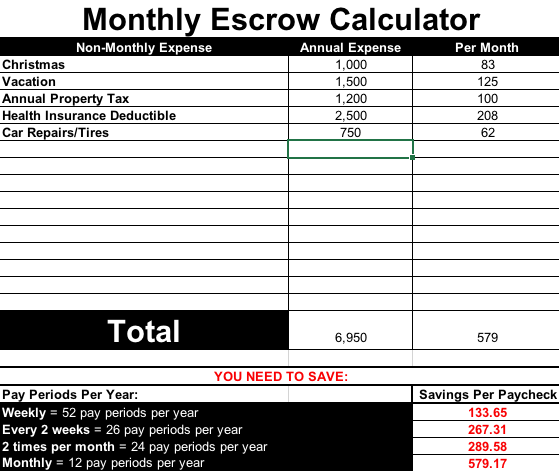 Make your savings for these expenses AUTOMATIC by establishing an auto-draft. Still looking for the perfect Christmas gift? Look no further! Give someone the gift of financial freedom this Christmas! Check out our Christmas Bundle HERE. During the month of December, you can get a copy of I Was Broke. Now I’m Not. (fundamental financial principles), Oxen: The Key to an Abundant Harvest (basics of investing), and What Everyone Should Know About Money Before They Enter The Real World (designed to help young people prevent money mistakes) for just $48 plus FREE SHIPPING! That means that you’ll save over 25%! If you know someone that could benefit from these books (and I’m sure you know more than one! ), pick up the bundle today! Or, snag a bundle for yourself so that you can go into 2019 with a better handle on your finances as well! This offer is valid for the month of December so check it out HERE today! Earnings/Income Goal: Set a goal for how much money you want to earn this next year. The more valuable you can be in your career, the more money you can bring home to your family. Giving Goal: How generous do you want to be this upcoming year? Do you want to give more to your church or have different charities you would like to support? Set a goal for how much money you want to be able to give away next year so you can be intentionally generous. Saving Goal: How much money do you want to put aside in savings? Do you want to have a fully funded emergency savings? Do you need to start saving for a new vehicle? You could even get ahead of the game and start saving for Christmas next year in January! How awesome would it be to have a full Christmas fund by September of 2019? You should set a savings goal to get ahead of expenses that will pop up. Investing Goal: Do you want to increase the amount that you contribute to your retirement fund? We have never heard anyone say “I have saved too much for retirement”. Decide how much money you want to start putting away in investment accounts for the future. Debt Elimination Goal: Are there any debts that you want to see leave your life for good? Is there a medical bill you need to pay off? Are you ready to break up with Sallie Mae? I remember when debts left my life and it was a great feeling. Make sure you have set a goal for how much debt you want to be rid of by the end of 2019 and never look back! Once you have decided on the goals you want to accomplish, write them down! When you physically write something down you are way more likely to actually do it! How awesome would it be if you could end 2019 being more generous with more income, more money in the bank, more of your money working for you AND less debt? Think about your goals, write them down, then make it happen.